In a conversation earlier this week I learned that the big Hollywood talent agencies have come to the recognition that “audience aggregation”, a component of what I have been calling a “vertical” strategy, needs to be incorporated into their thinking going forward. This was signaled very strongly recently when longtime publisher Steve Ross took his fledgling business offering self-publishing advice to authors with him to the Abrams Artists Agency where he set up a new department for them to represent authors rights to publishers. What does that mean? It means that the celebrities will start increasingly try to “own” their audiences: to gather them in networks, bind them with various content offers like newsletters or other material from the person they “know”, and sell them stuff. The people managing the careers of movie stars are seeing the writing on the wall. The intermediary structure that connected the stars to their public — studios, producers, theatrical distribution — is suffering the pain of all media: declining prices for content because of the increase in supply and consumption habits changing because of more and more quality screens and digital delivery. Many authors, of course, are trying to do the same thing. They have web pages; they collect the names of those who want to keep in touch with them; and they are, increasingly, selling them stuff. Sometimes the stuff is content (with a way blazed by Joe Konrath and his successful conversion from published author to self-publishing author, so far almost exclusively through Amazon) and now, thanks to Open Sky, they could be selling anything at all. So the authors and the movie stars are getting ready for the day when they have to bring real live customer contact to the party if they want to be invited. But the big publishers are lagging behind here. Why? One reason is that the big accounts appear to have intimidated them from selling direct to consumers. This is the kind of thing you don’t know for sure from the outside. Conversations between publishers and their top accounts, like conversations between publishers and the agents for their top authors, are private and closely guarded. But it has been anecdotally reported in the past that Barnes & Noble is not happy if publishers sell to consumers. And I’ve also heard that Amazon has told publishers that if they charge any price lower than the suggested retail in a direct sale, Amazon will consider that lower price to be the basis of their discounts, not the suggested retail. In a business that is built on the leverage of intermediary trading partners who aggregate customers, which trade publishing is, very few are in a position to gratuitously annoy the two most powerful levers they have. So the publishers have been reluctant to be seen to be selling direct. This concern also applies, for the same reason, to the wholesalers Ingram and Baker & Taylor. Both depend on bookstore business for their survival and it is, perhaps, an enlightened position not to compete with their core customers so neither company sells directly. But it is very constraining. Baker & Taylor really needs a full-line store to sell their BLIO ebook platform, but they can’t do it themselves. And Ingram — our client but we have not discussed this question with them at all — serves publisher clients as a DAD and as an ebook wholesaler who could use a retailing capability; but it is a very longstanding Ingram policy not to compete with their bookseller customers. That’s the context in which LibreDigital announced their new SkyShelf service last week. SkyShelf is a direct-to-consumer ebook sales capability for the publishers LibreDigital serves as a digital distributor, but it gives them a certain amount of “deniability” or distance from it. In my opinion, the big publishers must face some very critical questions fraught with customer relationship management challenges. On the one hand, publishers — all publishers — must start forming direct relationships with end users. They have no choice. Authors are doing it. The retailers are doing it. The Hollywood stars and politicians and ballplayers they want to write books for them are doing it. Part of what the publisher wants to get paid for is marketing. When the most important marketing asset for any book is the number of likely-interested people who can be emailed about its publication, publishers without any names to offer will have a harder time selling their value. Publishers who do have names on file — from Digital Book World owners F+W Media to Hay House to Harlequin and including others that grow in number every day — are already benefiting. They’re selling more copies expending less marketing money and they’ve got something important to offer authors looking for a publisher. But it is hard to collect names and build a relationship with an audience if you don’t sell things to them. That’s one place that big publishers are really stuck at the moment. That’s why LibreDigital built SkyShelf to help them out. At the same time they put their competitor Ingram in a ticklish spot because it is hard for them to offer a similar service for the same reason that publishers need the help! At the same time, the big retailers are pushing their way up the value chain into the publishers’ territory. Amazon has had self-publishing capability that is aimed at authors for a long time. Barnes & Noble invested in iUniverse, one of the first self-publishing start-ups (now part of Author Solutions), over a decade ago. Now B&N has delivered a suite of services called “PubIt” to compete with Amazon’s offering for authors. 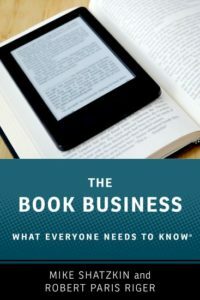 Amazon has such a large share of the online print and ebook businesses that, with the publisher disintermediated and the author able to take a much larger share, they can credibly make the argument that a branded author — or one that otherwise does her own promotion and marketing — can make as much money through them alone as through a publisher serving the entire market. It is more difficult and expensive for Barnes & Noble to leverage their store shelves for self-published authors but, to the extent they can, it will be a very attractive lure. I’d be very surprised if they’re not thinking about how to do that. Borders did a deal with self-publisher Lulu a couple of years and a couple of management changes ago. How long will it be before they revitalize that arrangement and add more competition for the authors’ attention? The names of people potentially interested in a book who can be contacted for free will be the most important coin of the publishing realm in a short time; in some cases, it is already. There are publishers who are emailing to millions of names every month right now, but none of them are the biggest publishers. If gathering names is not a major priority at any publishing house, it surely should be. It’s mission-critical; it’s about survival. Seen in that light, it must certainly be worth some tough negotiating with major accounts if that’s what publishers have to do to make it happen. This post was provoked by new information, about what the Hollywood agents are doing and about the launch of SkyShelf. But we’ve been pounding this drum of direct contact for some time. We did a pair of posts (here and here) with the help of direct response expert Neal Goff a few weeks ago trying to push publishers in this same direction. Those posts were about how. This one is about why.